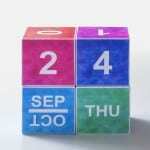 Looking for a way to personalize children's furniture? 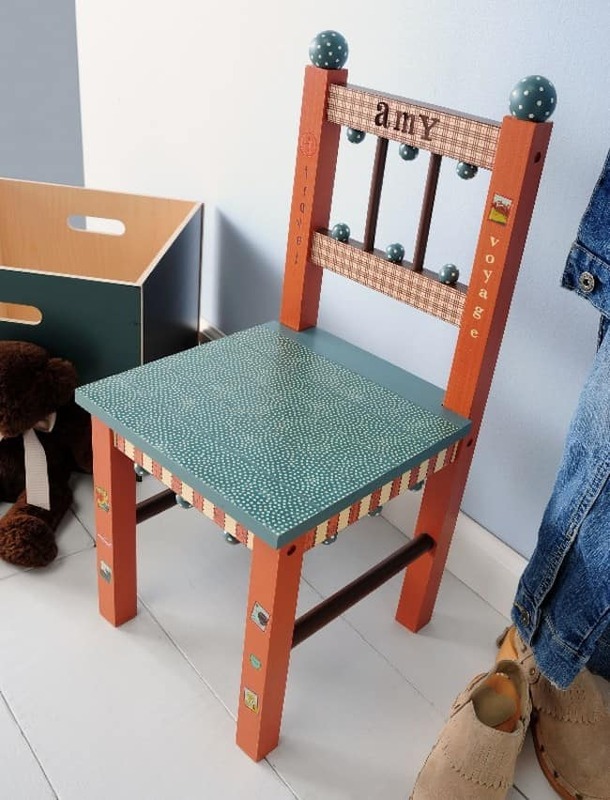 This kids decoupage chair is easy to make with your favorite colors of paint, paper and Mod Podge. Confession. I love wood balls. Especially ones with polka dots. Before you start laughing, realize that I'm very serious – that is why I used them in copious amounts on this kids' chair. My friends Christopher and Holli have taught me a lot about “blinging” out projects, and they introduced me to wood balls. I think one of my biggest challenges as a crafter has always been how to finish things, because my style always leans toward simple. Simple is good, but sometimes you need a little added flair. And in comes this kids' decoupage chair. PS – I know my name is on the chair, but don't worry, I won't sit on it. It's a small chair and I don't want splinters in my bum from breaking it! 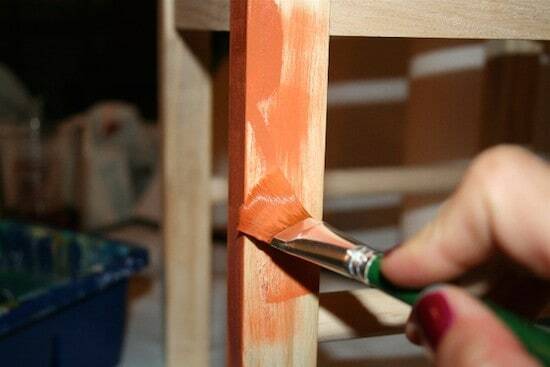 The first thing you should do is assemble your chair and paint it. I hope you aren't like me, forgetting where you put the screws for the seat. It's okay – I was able to paint the seat separately. 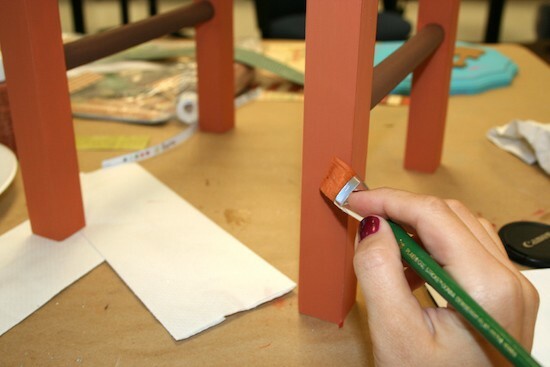 Paint the chair legs Terra Cotta, the crossbars Coffee Bean and the seat Greenscape. Check out the project photo for reference. Remember to give your chair enough coats of paint. It took me two to cover the entire chair. Allow to dry. 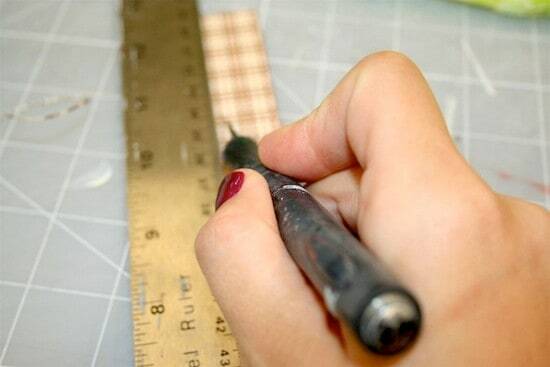 While you are waiting for the chair to dry, measure and cut out your papers. I didn't use any templates, I simply measured the areas I wanted to cover with paper and cut to fit. I covered the top and bottom slats on the chair back, the five seat slats and then the slats underneath the seat. This is showing you how I laid out the papers to make sure that they would fit. Do any trimming that's necessary. 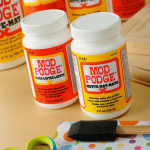 Time for the Mod Podge action to begin! 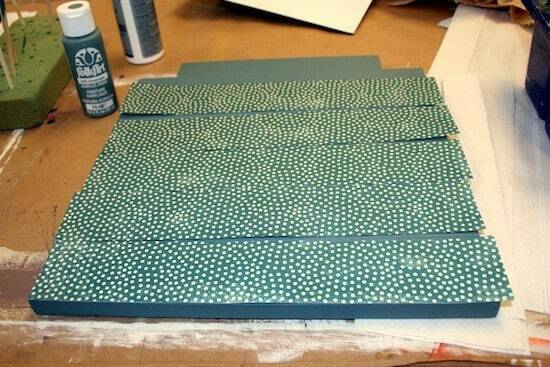 Working one piece at a time, spread a medium layer of Mod Podge over the slat of the chair seat. 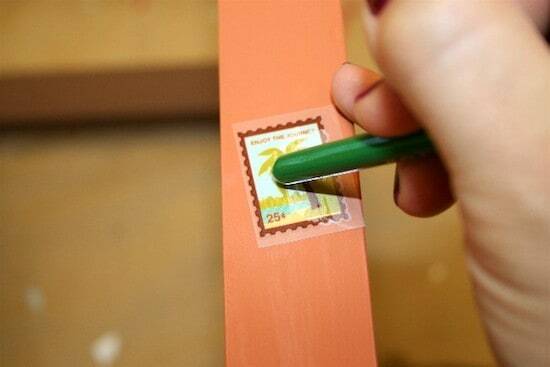 Smooth your paper down with your fingers – remember to smooth, smooth, smooth! Keep smoothing until all of the air bubbles are gone. 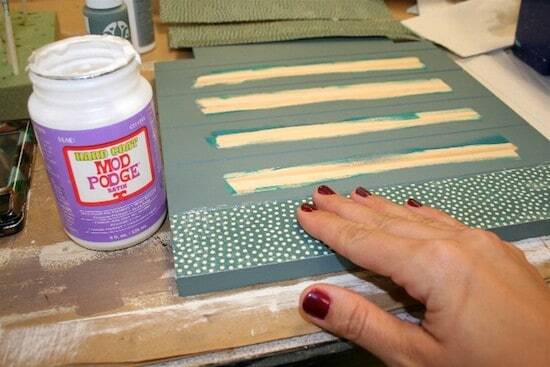 If any Mod Podge comes out the sides, wipe it away with your brush. It's better to use too much Mod Podge rather than not enough. Repeat with every piece of paper that you cut. Allow everything to dry for at least 15 – 20 minutes. 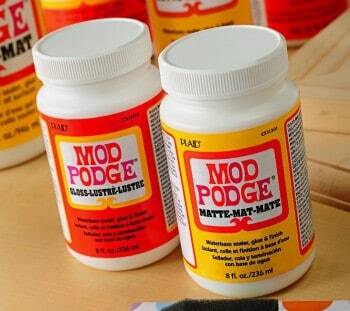 Go back and coat the top of your papers with Mod Podge. 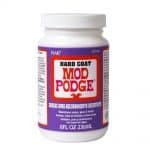 At this time you can coat the entire chair with Mod Podge. I recommend working in stages, painting with Mod Podge and allowing to dry before you move onto another area. Coat the chair one complete time, allow to dry and then do it again. At this stage you may be better off allowing it to dry overnight. It should at least be dry to the touch. 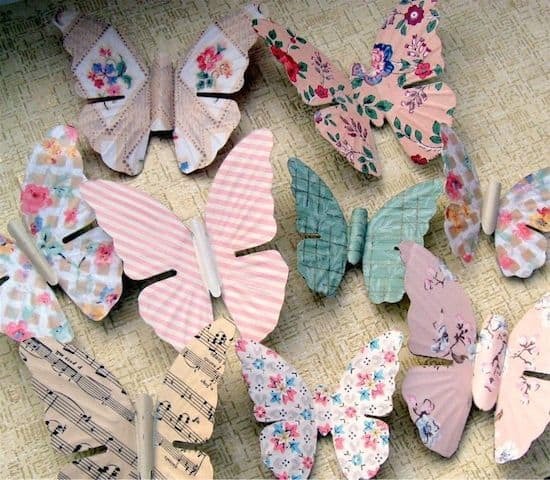 Apply rubons and stickers to your decoupage chair as desired. I added rubons to the front of my chair in a random pattern, as you can see in the finished photo. I just used the bottom of my paint brush to attach the rubons – it worked well. I also attached stickers spelling my name on the chair back so you could see what they look like. I probably will change the name when I have a cute little child to give it to! Give the rubons a coat of Mod Podge to seal them. You don't want them to scrape off with handling. Allow to dry. I realized I was almost done – but that the chair needed something. I know, I know. Polka spotted balls! What little child's chair doesn't need balls with polka dots? But you already knew that. It took me a moment to realize it. I made this handy-dandy contraption for my ball painting. It's a Styrofoam block with small dowels stuck into it. 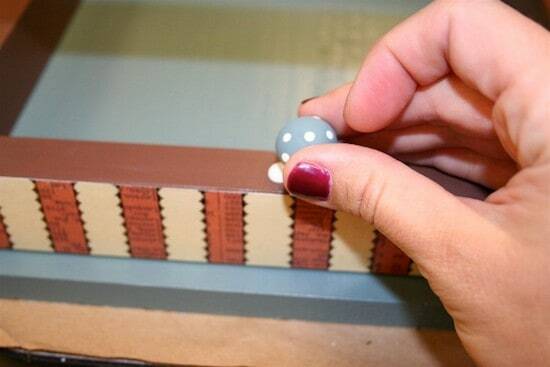 You can easily paint your wood balls without making a mess on your hands. 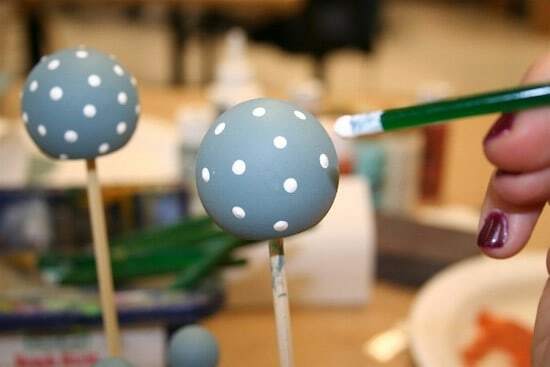 The polka dot part of the balls is so easy. 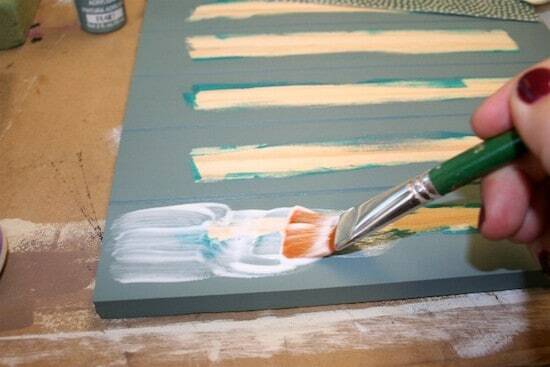 Just use the end of your paint brush, dip it into the Ivory White and touch to the wood ball. Repeat with all of the balls, making random polka dots here and there. Allow them to dry. 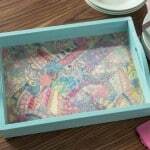 Seal them with Mod Podge and allow to dry. As you can see, I finally found the seat screws and attached it so that someone could sit in it. It is a chair, after all. 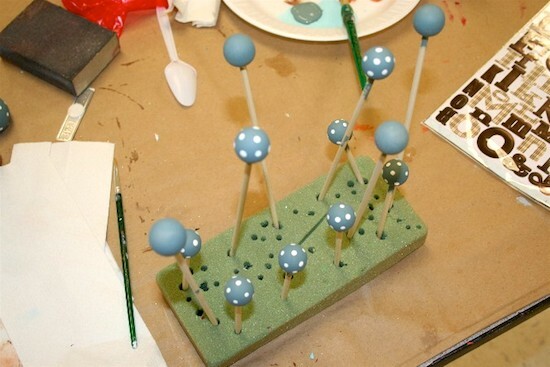 Glue the balls onto the chair – use the two large on the top back of the chair, six small on the chair back and then spread the other 12 around under the seat as shown. 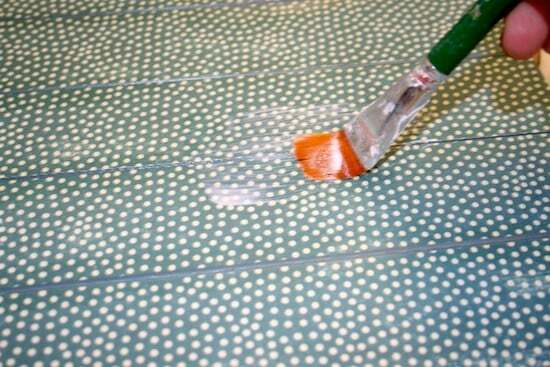 Allow your decoupage chair to sit for 24 hours by itself before using. The chair turned out adorable!!! Great idea for a kid’s chair! (cute post too) I have the opposite problem and tend to overdo everything as apposed to keeping it simple! Love that chair! In some ways it reminds me of Mary Engelbreit’s style. Soooo cute. Love it! Great job Amy! Your chair came out adorable but the look on your babies face next to you is priceless. Love the idea on how you paint your wooden balls,I’m not as creative as you but did use some as bird eggs in a nest on my wreaths. 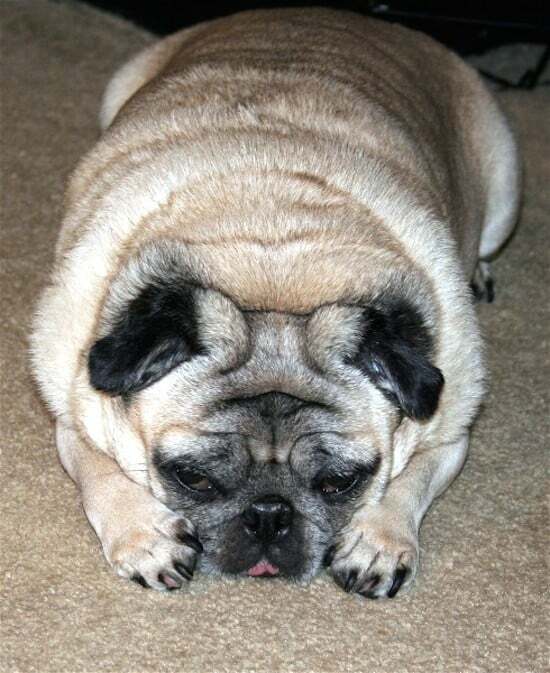 lack of snugglitis, is contagious, My kids and my dog get it,, then they give you those sad puppy dog eyes,,,,,,,,,,, it heartbreaking! anyways,, I love those BALLS! hee hee..
head over to my blog,, I have a little sumtin for ya! got a problem with water touching things that have been done with mod podge so what do u recommend to fix that problem?…i want it to hold up to the idea of water what when i am done! So cute Amy, love it! Very, very cute. Sometimes polkadotting your life is necessary for happiness. Right? Thank you for sharing. I love the chair! Great job and thanks for sharing! I just found your blog and am your newest follower. Thanks for creating such an amazing blog full of inspiration. I’ll be back often (and I LOVE the chair! Your chair is just way toooo cute. Visiting from Show and Tell at Blue Cricket. This is FABULOUS! As I search for the perfect table and chair set for my girls playroom I am inspired to do up the chairs now when I get some!